A Flood of Failures: Beyond ODPM. Image Courtesy Flickr User ‘Trinidad News’ using a Creative Commons License . This isn’t a technology post; however, it’s a post about failed systems and tangible problems here in Trinidad and Tobago. There’s much that has been said about the ODPM, and having seen the press conference they suffered Trinidad and Tobago and the rest of the world with, I’ve decided not to throw them under the bus only because they are already under the bus. It’s not even a challenge, but I offer they are under the wrong bus and those that should be with them are not under it. Instead, I will write perhaps what they should have said as well as what should be corrected. We have a tendency to believe that the ODPM, like any government agency, is on it’s own. When I look to criticize constructively, as someone with a technical background it is expected of me to point out the incompatible systems, the bottlenecks, and the problems with the apps and websites. Those are painfully obvious, and I have written about them before in the context of Brett. Instead, let’s look at the systems. We have a few agencies that are really involved with the flooding who are not garnering the attention they should be after these incidents – the ODPM, in this way, is a red herring offered for the masses to feed on. The real problem is deeper, and the ODPM’s failures – as real as they are – only skim the surface of the actual problem: Flooding during wet season, water retention during dry season. I’d say that avoiding flooding is a part of current and future human, ecological and economic needs. So, how is it that a large amount of rainfall has created a problem that the ODPM cannot handle on more than one occasion? How is the EMA involved in that? Is it involved in that? Should it be involved in that? It sounds like it is a big part of their job to this layperson. This department is one I mainly know for authorizing land development and even changing land zoning. Clearly they should be working with the EMA; what they actually do is hard to find since they have an almost random note on the Ministry of Planning and Development’s website. They clearly should be more transparent. Website, anyone? That they are almost always ignored in land development is something that may have something to do with that, as well as what seems to be an arduous process to get anything done – so much so that illegal land development has been an underlying problem with some of the flooding. This is such a case that the Minister of Works has said he’ll be going after illegal land developers. And yet, legal land development is hardly something that information can be found for, and what can be found is typically through people who know how the system works and how it doesn’t. In some regards, this could be considered corruption, in others, it could be an inefficient bureaucracy that frustrates people to the point that they just go do their own thing. Why is the Ministry of Planning and Development, Town and Country Division, more effective in reducing the potential for flooding? You’d think that they and the EMA would be joined at the hip. We’re told that WASA is responsible for all the water in Trinidad and Tobago. Though I have never see it in writing, all water on the ground in the country allegedly is WASA’s water – unless, of course, there is flooding, where not even WASA wants it. I bring them up because what we see as flooding in wet season is potential water to retain during dry season. In a country where many people still wait for pipe-borne water to fill their tanks on a daily basis, where water is almost always a problem during dry season, one has to wonder how WASA’s water retention isn’t being looked at as well. As I regularly pass across Mosquito Creek, as many others do, we all see the problems with drainage. Flooding along any roads? So yes, the ODPM didn’t handle the cascade of failures that creates flooding again. 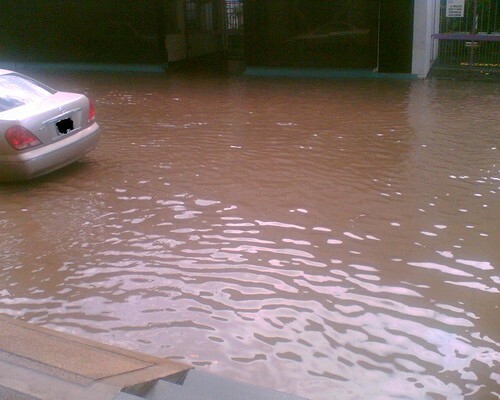 Sure, the Regional Corporations are also culpable at least to an extent – but with all this bureaucracy to save us from flooding, do we really want to blame the ODPM, forced to drink all this water, for wetting the bed? Clearly, the ODPM needs some work, but how much should we expect from them when much of this could be prevented? Next > Humanoid Gets Citizenship: Odd.